This was supposed to be my book from Liechtenstein for the Read The World challenge. It was listed as Nora: A Novel from the German by Marie, Princess of Liechtenstein. All the companies selling it are ones that do ‘reproduction’ copies of scanned out-of-copyright books, complete with slight scanning errors and blemishes; which is a useful service, but the metadata tends to be a bit sketchy. I did some googling, but couldn’t find any information about the book. But when sitting down to write this post I had one more go. And I discovered I had read a 360 page novel that was only translated by a Princess of Liechtenstein; and that the reason her English was so excellent was that her maiden name was Mary Fox. She actually sounds like an interesting character; she was a foundling adopted by Henry Fox, 4th Baron Holland who met Prince Louis of Liechtenstein in Naples. The Princely Family of Liechtenstein ‘initially refused to approve the marriage’. The contemporary literary criticism she judged as the most talented and most important of the Catholic authors, whose creations […] at the best achievements of female literacy at all included (Hinrichsen, 1891). As a writer with a strong interest in social questions, it published first During the war years 1864, 1866 and 1870 prussia friendly minded time poems. So my novel from Liechtenstein is a novel from Germany, translated by a writer born in France and raised in London. All of which is slightly annoying — I wish I’d managed the detective work before reading it — but thankfully I rather enjoyed it. It’s a sentimental melodrama about a pair of star-crossed lovers, and it’s very dated — snobby, silly, and occasionally offensively anti-semitic — but I like a bit of soapy melodrama from time to time. The lovers are a young German count and Nora, the daughter of a circus-rider. So that’s the social divide; but obviously that’s a bit radical, so her father is from a French noble family, has gentlemanly airs, and is very wealthy, as proprietor of the circus. And her genteel mother asks on her deathbed that Nora should be sent to be educated at the most exclusive convent school in Belgium. And Nora, despite the stain of her background, is an absolute paragon of piety and decorum. She’s such a paragon that you might think the message of the book was: character is more important than earthly status, and that ancient names and noble titles are petty baubles next to a pure heart. But actually, even though most of the noble characters are fairly unpleasant, we’re left in no doubt that social class is Very Important. And while the nobles might be unsympathetic, the circus folk are positively subhuman with their vulgarity of taste and mind and morals. It’s a lot of twaddle, really. I was interested to learn some of Marie Fox’s biography though: as a Catholic foundling brought up in an aristocratic household whose marriage to a Prince is opposed by her husband’s family, you can see why she might see parallels to her own life in the story of a circus-rider’s daughter educated in a convent whose engagement to a German count is opposed by his family, and why she would like the idea that upbringing can triumph over humble origins. Anyway, I will provisionally count it for the moment as my book from Liechtenstein, even though it’s a bit of a cheat. I mean I could spend twenty quid to read Prince Hans-Adams II’s thoughts on the place of the nation state in the C21st century, or sixty quid for Sieglinde Gstöhl’s The Neighbours of the European Union’s Neighbours, but I’m not enthused. Perhaps I’ll just read a jokey outsider’s book about Liechtenstein’s football team and call it a day. 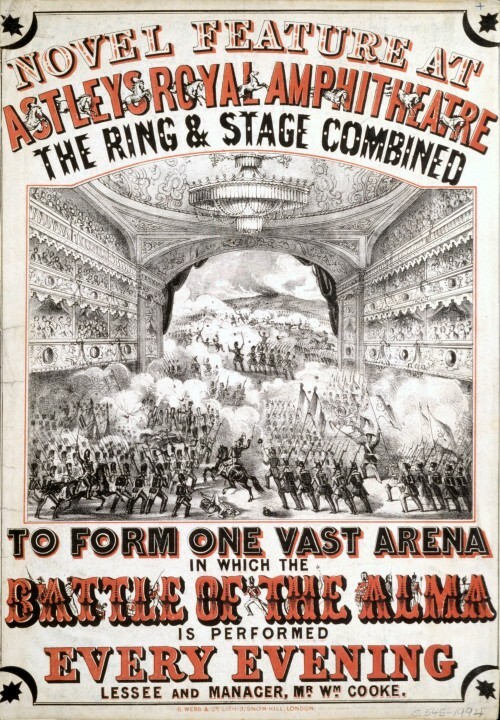 » The poster is from this V&A article about Astley’s Amphitheatre.